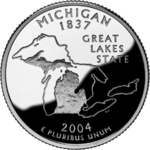 Depicts the outline of the State and the Great Lakes system. From 1825 when the opening of the Erie Canal connected the Great Lakes and the Hudson River and New York City, until modern times, much of Michigan's social and economic history and livelihood is tied to the Great Lakes. Michigan shores meet four of the five Great Lakes - Lake Superior, Lake Michigan, Lake Huron and Lake Erie. Inscription: Great Lakes State. 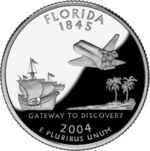 Depicts a Spanish gallon, symbolizing discoveries of the past; a Space Shuttle representing the discoveries of the future; and Sable palms, Florida’s state tree. The choice of imagery highlights Florida’s history a focal point for discovery, from the 16th century explorations of Ponce de Leon and Hernando de Soto to its central role in the space program of modern times. Inscription: Gateway to Discovery. Depicts a star superimposed on an outline of the state encircled by a lariat. The lariat is symbolic of the cattle and cowboy history and frontier spirit of Texas. Icons of westward expansion, the Texas cowboy played an important cultural and economic role driving cattle from the ranches where they were raised hundreds of miles to the nearest railroads. 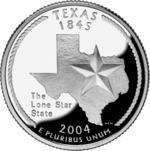 Inscription: The Lone Star State. Depicts a one-room schoolhouse with a teacher and students planting a tree - based on "Arbor Day," a painting by Iowan Grant Wood. The classic painting reminds people of Iowa’s rural frontier heritage, the importance of agriculture and natural resources to the state’s history, and is a testament to Iowa’s long standing commitment to education. 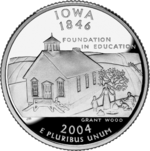 Inscriptions: Foundation in Education and Grant Wood. Depicts a cow, a round of cheese and an ear of corn. The images are a tribute to Wisconsin’s dairy heritage. Wisconsin is home to more dairy farms than any other state: nearly 14,000 dairy operations caring for over 1.25 million dairy cows. Cheese making in Wisconsin dates back more than 160 years when people would make cheese at home as a way of storing excess milk. Today the state produces billions of pounds of cheese each year and is celebrated for the varieties and specialty products. Inscription: Forward. 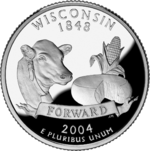 There are two dramatic and highly sought after Wisconsin state quarter errors. One is called "extra leaf low" and contains an extra leaf on the left of the corn stalk pointing down. The other is called "extra leaf high" and has an extra leaf on the left side of the corn stalk pointing up. There is some mystery surrounding the Wisconsin leaf varieties. Some believe them to be legitimate errors produced by die gouges. Others suspect they were intentionally produced. 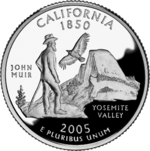 Depicts naturalist and conservationist John Muir, Yosemite Valley’s monolithic granite headwall known as "Half Dome," and a California condor. Muir dedicated his life to conservation and preservation of the Western forests and was influential in establishing both Yosemite and Sequoia National Parks. He founded the Sierra Club and served as that organization’s President until his death in 1914. Inscriptions: John Muir and Yosemite Valley. Depicts a tree-lined lake with two people fishing, a loon on the water, and a textured outline of the state. The official state bird, loons are found on lakes throughout central and northeastern Minnesota. 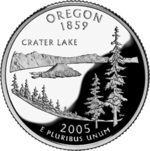 The coin celebrates the state’s heritage of natural beauty and outdoor recreation. Minnesota is home to the Boundary Waters Canoe Area Wilderness, a one-million acre wilderness area with more than 1,500 miles of canoe routes. 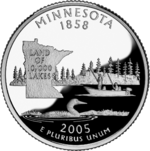 Inscription: Land of 10,000 Lakes. 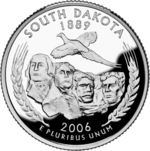 The Minnesota extra tree varieties have been found on coins from all of the mints – Denver, Philadelphia and San Francisco. The extra trees are the result of doubled die errors. All told there are dozens of different extra tree errors. Depicts a portion of Crater Lake, incorporating Wizard Island, as well as Watchman and Hillman Peaks on the lake’s rim. Crater Lake is the deepest lake in the United States and the seventh deepest in the world. The lake partially fills the collapsed caldera of the ancient Mount Mazama Volcano. President Theodore Roosevelt established Crater Lake National Park in 1902, with the lake itself as the Park’s crown jewel. Inscription: Crater Lake. Depicts a sunflower, the state flower, and a buffalo, the state animal. Millions of buffalo once roamed the Kansas prairie. Although the wild Plains Bison was largely gone by the late 19th century, they now roam the state again on private land and in state parks. In addition to its natural beauty, the sunflower is an important part of Kansas agriculture. Sunflower oil is a valued staple and sunflower seeds are enjoyed as a healthy snack and nutritious ingredient to many foods. 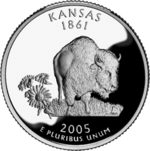 In the Humpback Buffalo Kansas strike variation a die break gives the appearance of one hump atop the other. Depicts the New River and the New River Gorge Bridge. 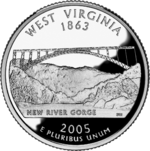 The image is a tribute to the scenic beauty of West Virginia combined with a tribute to the engineering feat exemplified by the New River Gorge Bridge. At 3,030 feet long and 69 feet wide, the bridge is the world’s largest steel span and the second highest bridge in the United States, rising 876 feet above the New River Gorge in southern West Virginia. Inscription: New River Gorge. Depicts a trio of wild mustangs, the sun rising behind snow-capped mountains, and a border of sagebrush. The imagery is a tribute to Nevada’s affection for its wild horses, central figures in its vast deserts and many mountain ranges. 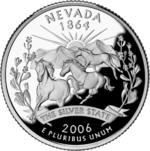 Nevada’s nickname, The Silver State, traces back to the Comstock Lode, one of history’s greatest mineral discoveries. 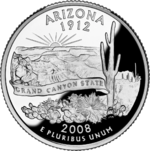 Inscription: The Silver State. Depicts an ox-drawn covered wagon carrying pioneers in the foreground and the National Historic Site Chimney Rock. Chimney Rock is the most famous landmark on the Oregon-California Trail, the 2,000 mile east-west wagon route that connected the Missouri River to valleys in Oregon. As many as half a million emigrants and other travelers headed west on the trail in the days before the transcontinental railroad. Inscription: Chimney Rock. Depicts the Rocky Mountains, home to some of the nation's most majestic natural wonders. 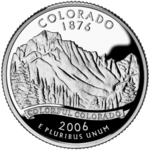 Although it is intended to represent all of the mountains of Colorado, the image is based on Longs Peak. At over 14,000 feet Longs Peak is the highest peak in Rocky Mountain National Park. Inscription: Colorful Colorado. Depicts the State bird, a Chinese ring-necked pheasant, in flight above the Mount Rushmore National Memorial, bordered by heads of wheat. The famous Mount Rushmore National Memorial sculpture features the faces of four American Presidents: George Washington, Thomas Jefferson, Theodore Roosevelt and Abraham Lincoln. Overseen by sculptor Gutzon Borglum and later by his son Lincoln Borglum, 400 workers labored on the mammoth 60-foot figures between 1927 and 1941. Depicts a bison skull above a Montana landscape. The bison skull has a special place in Montana culture. The Native Americans and early European settlers depended on the bison for their very survival, as the animals provided food, clothing, medicine, tools and more. The bison skull reflects the rich native tradition of Montana, and is sacred to many of Montana's Native American tribes. 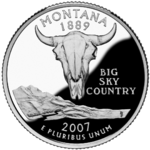 Inscription: Big Sky Country. Depicts a king salmon breaching the water with Mount Rainier in the background. Mount Rainier, an active volcano, is the symbolic bridge between the eastern and western parts of the State. 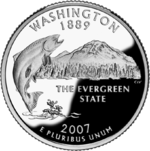 The salmon image is a tribute to Pacific Northwest culture in which the native peoples of the Pacific Northwest relied on the fish for sustenance. Inscription: The Evergreen State. Depicts the Peregrine Falcon and an outline of the State of Idaho. The Peregrine Falcon is one of conservation’s great success stories. Once on the endangered species list, it can now be found throughout Idaho and the United States. 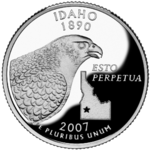 The coin celebrates the role of Idaho in the effort to save the raptor as home to the World Center for Birds of Prey in Boise. Inscription: Esto Perpetua (translation: May it be Forever). 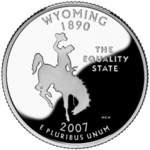 Depicts a bucking horse and rider symbolizing Wyoming's Wild West heritage. First settled by fur trappers, Fort Laramie, Wyoming, later became a popular destination for pioneers traveling the Oregon Trail. Inscription: The Equality State. Depicts two locomotives moving toward the golden spike that joined the Central Pacific and Union Pacific railroads, linking the east to west coasts of the United States. 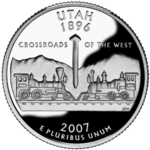 On May 10, 1869, two steam locomotives met at Promontory, Utah, for the "Joining of the Rails Ceremony." The event marked a turning point in the development of the American West making cross-country travel more convenient and economical. Inscription: "Crossroads of the West." 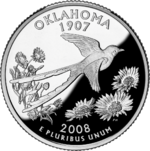 Depicts the state bird, the Scissortail Flycatcher soaring over the state wildflower, the Indian Blanket. Feeding mostly on non-beneficial insects, the Scissortail Flycatcher is known for its unmistakable and spectacular tail feathering as well as the dramatic aerial displays of the male during courtship. The imagery of Indian Blanket (or Gaillardia) symbolizes the State’s rich Native American heritage and native long grass prairies that are abundant in wildlife. Depicts a Zia sun symbol over a topographical outline of the state. The great influence of Native American cultures can be found throughout New Mexico. The Zia Pueblo of New Mexico revere the sun, and the sun symbol, a red circle with groups of rays pointing in four directions, is a frequently seen on pottery, art, and other artifacts. The number four is sacred to the Zia, and sun symbol embodies this number as the powers of nature- the sun, the four directions, seasons, and the ages of man. 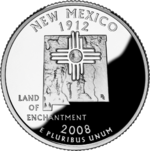 Inscription: Land of Enchantment. Depicts an image of the Grand Canyon with a Saguaro cactus in the foreground. The Grand Canyon is one of the seven natural wonders of the world. It is 277 miles long, at its widest is 18 miles across and at its deepest is over a mile in depth. Inscription: Grand Canyon State. 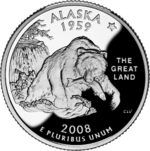 Depicts a grizzly bear with a salmon in its jaw symbolizing Alaska’s natural beauty, abundant wildlife, and vast unspoiled wilderness. People come to Alaska from all over the world to catch a glimpse of these majestic hunters weighing as much as 1,000 pounds. Tourists can see them in places such as Denali and Katmai National Parks, Kodiak Island and Admiralty Island. Inscription: The Great Land. 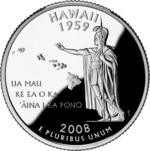 Depicts Hawaiian monarch King Kamehameha I (also known as Kamehameha the Great) stretching his hand toward the eight major Hawaiian Islands. Kamehameha conquered the islands unifying them as the Kingdom of Hawaii. He is credited with navigating Hawaii through a time of great change, while working to preserve the native practices and traditional ways of island life. Inscription: UA MAU KE EA O KA ‘AINA I KA PONO (translation: The life of the land is perpetuated in righteousness). 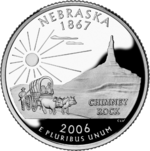 These prices for the 50 State Quarters are provided as a service to Hobbizine readers. 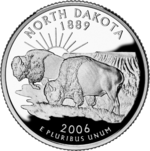 They are derived from numerous sources such as dealer price lists, advertisements in numismatic publications, and public auction results. 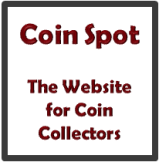 Use these values as a guideline for evaluating the reasonableness of dealer prices, setting up trades with other collectors, and estimating the worth of your collection.